The biotechnology sector performed strongly during March and April. Some sector-specific and market-related factors are clouding the positive narrative of the Biotechnology sector. Even though near-term caution is advisable, we anticipate these clouds to be transient and things to become clearer as the month passes. The biotechnology or biotech sector, represented by ETF IBB which tracks the Nasdaq Biotech Index (NBI), showed improving performance during March and April after lagging the broader market rebound. The IBB has moved up from its March low level of 240 to its recent high of 290, a 21% rise. The rise from recent lows though notable, still lags the broader market. This should not be surprising as the sentiment shift during the correction was more profound in the Biotech sector, with a decline of 40% compared to 15% and 20% for S&P500 and Nasdaq, respectively. Nonetheless the biotech sector began to pick up steam in March-April, particularly in the midcap and smaller cap segments. The IBB is driven to a significant extent by the large-caps – about 60+% weightage. 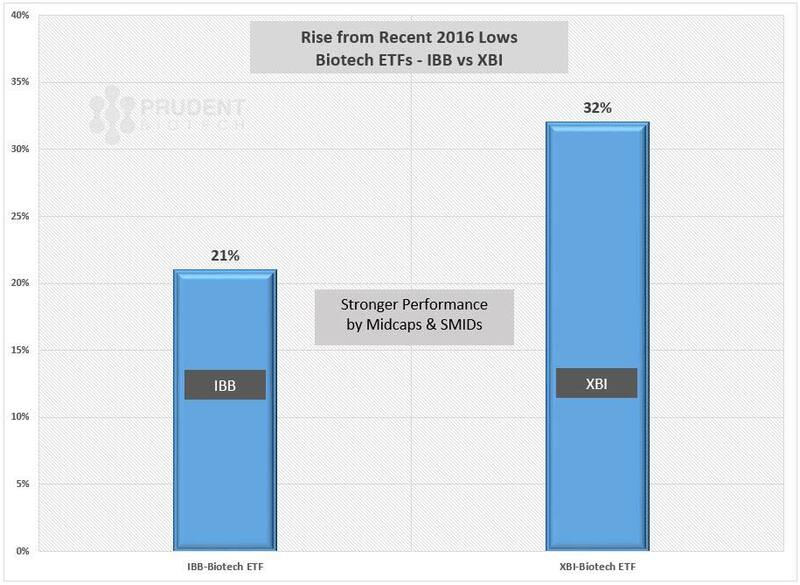 Another proxy for biotech sector is XBI, an ETF which tracks the S&P 500 Biotechnology Select Index (SPSIBI) with a greater emphasis towards midcaps and SMID. Its Top 10 weighted list, presented at the end, comprises only a single largecap with the rest being midcaps. This sector ETF has risen 32%, from its recent lows, and has kept better pace with the broader market. As we had noted in our previous commentary and blog postings, although the Biotech sector is showing signs of performing well, it will not be a straight climb up, but more of a two-step forward and one-step back. A benign interest-rate policy typically supports the relatively riskier segments of the market, and that will be true for the biotech sector as well. In addition, the troubles of Valeant (NYSE:VRX), which was a big drag on sector sentiment earlier, appear to have moderated out. Furthermore, the midcap and smallcap sector should benefit from an improving financing market, and consolidation interest from the large cap segment and big pharmaceuticals or pharmas like Novartis (NYSE:NVS), Pfizer (NYSE:PFE), Merck (NYSE:MRK), AbbVie (ABV) and Allergan (NYSE:AGN). But there are some sector-specific and market-related factors that are clouding the positive narrative of the Biotechnology sector. 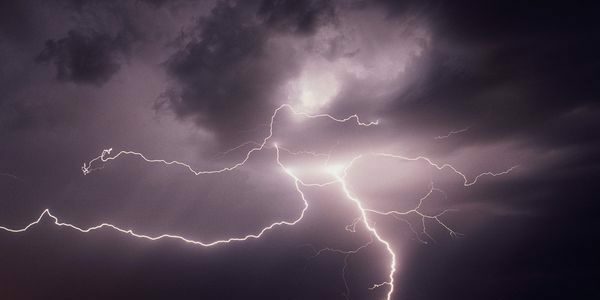 Weaker earnings from the sector giant Gilead Science (NASDAQ:GILD), along with large caps Vertex Pharmaceuticals (NASDAQ:VRTX), and Alexion Therapeutics (NASDAQ:ALXN), have created earnings anxiety. Amgen did deliver a strong earnings report, along with Celgene (NASDAQ:CELG), without making a favorable impact on investor sentiment. Regeneron (NASDAQ:REGN), which is 22% owned by large pharma Sanofi (NYSE:SNY), is expected to report today on May 5. Even the broader market has witnessed an earnings season, which could be characterized as mediocre at best. There have been some outstanding earnings from the likes of Amazon (NASDAQ:AMZN), Facebook (NASDAQ:FB), and auto manufacturers like General Motors (NYSE:GM) and Ford (NYSE:F). But such cases of "earnings beat" have been more of an exception. For the broader part, it has been less inspiring earnings from the likes of technology behemoths like Apple (NASDAQ:AAPL), Microsoft (NASDAQ:MSFT), Alphabet (NASDAQ:GOOGL), and Priceline (NASDAQ:PCLN). The earnings misery is captured by the statistic that the S&P500 has now delivered declining earnings for four quarters. In addition, the US economic growth is showing signs of faltering with the early report of Gross Domestic Product, or GDP, growth in the first quarter at an anemic 0.5%. 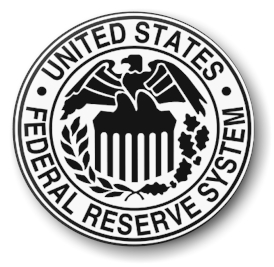 Combined with the mild inflation numbers running at 1.5% annual inflation, and below the 2% target of the Federal Reserve, it should alleviate concerns about a rate increase at the June meeting of the Federal Open Market Committee or FOMC. The Federal Reserve already has an accommodative policy. But we believe the question of further stimulating the economy may be back on the table for the FOMC members during the second-half, if the final reading of first quarter GDP remains below 1%, the second quarter GDP report is sub-1% as well, and the global economy particularly Eurozone, Japan and China continues to struggle. We do believe though that GDP growth for the second quarter should climb above the sub-1% level. The Senate special hearings on drug pricing are not a high-five moment for the Biotech sector. This time was no different either as the sector was under pressure last week during the hearings, which focused on Valeant's drug pricing model. The amalgamation of above factors has created a pocket of turbulence for the biotechnology sector, which warrants caution at this time. However, with lackluster earnings doing some damage but now out of the way, we believe there are still favorable triggers that can potentially create renewed interest in the sector going forward. Consolidation is a big part of the nature of biotechnology, and there are indications that the interest is increasing. Recently, Medivation (NASDAQ:MDVN) has been in the middle of such consolidation interest with Sanofi and Pfizer demonstrating interest, and perhaps a likelihood of Japanese pharmaceutical company Astellas (OTCPK:ALPMY) joining the bidding process. Gilead is hungry to acquire a portfolio of high-potential drugs. Pfizer, after failing with Allergan and AstraZeneca (NYSE:AZN), will remain active vetting potential candidates that can raise growth. AbbVie (NYSE:ABBV) recently agreed to purchase privately held Stemcentrx for nearly $6 billion, while in the related medical devices sector, Abbott Laboratories (NYSE:ABT) purchased St. Jude (NYSE:STJ) for nearly $30 billion. In addition, the upcoming release of abstracts this month for the American Society of Oncologists, or ASCO, conference can create greater positive news flow leading up to the corporate presentations in the first week of June. At the same time, the investor focus should again return towards the achievements of key drug development and approval milestones or the missing of such milestones. An example of achieving a prominent milestone was the successful testing of Celator Pharmaceuticals' (NASDAQ:CPXX) new leukemia treatment Vyxeos, while at the same time an example of missing some important support for a drug was the AdComm panel's recommendation to reject Sarepta Therapeutics (NASDAQ:SRPT) drug Eteplirsen for treatment of Duchenne Muscular Dystrophy, although the financial analyst community has continued to support higher price targets. This is typical biotechnology - highly news-driven about the pipeline products. Overall, biotechnology is a sector that is benefiting from secular trends of an aging American and European population, and the development of new technologies for drug discovery. At this time, some clouds have formed over the sector, thus urging near-term caution. As the sector-specific and broader-market indexes approach key support levels, there is a possibility of a breach which can create additional downside volatility. We anticipate these clouds to be transient and things to become clearer as the month passes. A diversified basket of large cap names combined with some promising midcaps and smallcaps, is a prudent way to build a biotech portfolio and manage the volatility from binary events. Besides Amgen and Jazz Pharmaceuticals (NASDAQ:JAZZ) as potential large cap holdings, in the midcap and SMID sector there are many promising companies like Acadia Pharmaceuticals (NASDAQ:ACAD), Neurocrine Biosciences (NASDAQ:NBIX), GW Pharmaceuticals (NASDAQ:GWPH), and Juno Therapeutics (NASDAQ:JUNO), to name a few, that can be considered as market conditions strengthen. Our Prudent Biotech Portfolio, which is driven by quantitative models, has returned to Cash for May. As of April end, it was up +4% vs a negative -21% for IBB for 2016. As always, do your own diligence for there are no guarantees in biotechs. This is our opinion as of now, and any unforeseen market conditions can make us reconsider and revise our viewpoint.